We mm…Yoga! crew are known for our lightheartedness. People often tell us our classes are fun. For some, especially if they've practiced in a more serious environment before, it's a surprise. But you know? Like I've said before, life is serious enough. You don't need to make yoga overly serious too. Yoga is about giving yourself permission to be who you are. It’s about finding your true self and embracing all the things you discover. Including joy. As adults we are expected to ‘behave’ all the time, to leave behind the silliness and frivolity of childhood and ‘grow up’. Bah! Boring! Who says adults can’t have fun? Who says we should be serious all the time? Why can’t we laugh more often? Yoga is about stress relief & laughing is the ultimate stress relief, so it seems smart to combine the two. Yoga is also about letting go of old patterns of behavior and thought, so why not let go of the seriousness we are expected to cultivate all the time? Yoga is about relaxing, so sometimes it's good to forget about being a grown up and giggle. Well, the real question is, why not have a giggle? If I look back on all the happy times I've had, a lot of it is filled with laughter and silliness. 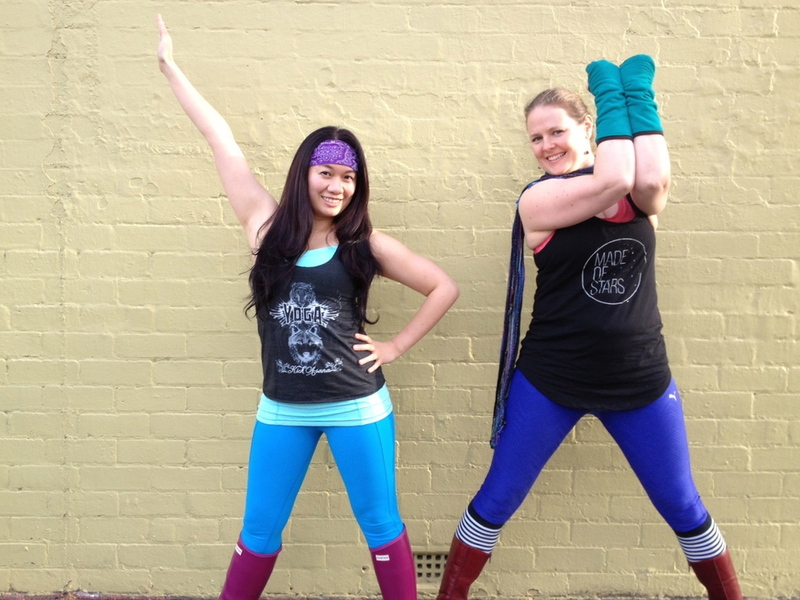 mmYoga Superheroes: We're not so serious about yoga. I've never done well with the 'serene' image of yoga. Serene isn't something that comes naturally to me; I do yoga to become more like that. Naturally, I am in equal parts anxious and silly. The happier I am, the sillier I get. Which is not a bad thing, in my (cough) humble opinion. In same opinion, I think the yoga world has a slight tendency to take itself too seriously. You can be plenty spiritual and still be happy/silly/have fun. In fact, I'd be suspicious of someone who claims to be spiritual, but lacks a sense of humour. If you've ever seen the Dalai Lama speak (and nobody's going to argue about his spiritual cred) you will know that he's got a great sense of humour. Superpowers: Sneakily getting you to work much harder than you expected by being cute and giggly. Helping people feel great again by means of Yoga. Dressing like a hipster & not being mocked for it. Yoga is about finding balance, right? So if we're serious 50% of the time, the other 50% should be not so serious. I like to teach that way too. Anatomy and alignment cues, I'm dead serious. All the lame jokes and terrible metaphors I use, not so serious. Superpowers: Reminding people how awesome they already are by means of Science. Helping people be more awesome by means of Yoga. Wearing knee socks and getting away with it. Together they are: mm…Yoga Superheroes: the Retreat Crusaders. You will have so much fun with them on our Bali Yoga Retreat in November - it's still early bird pricing till Aug 31, and there are still a few rooms left - hop to it! 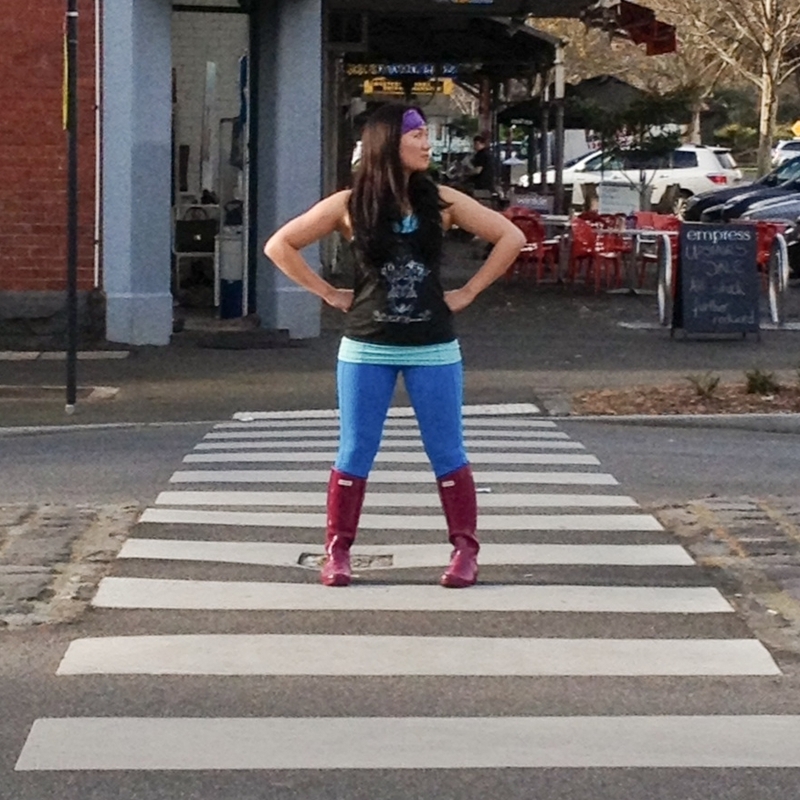 PS We'd love if you post your #mmyogsuperheroes pics on instagram. Not just Karen and Suzy, but other team members and students - join us? You are a super-hero too! Child’s pose. Not just for resting. Child’s pose is almost always referred to as a resting posture (hmmm, guilty), or found in the restorative section of your yoga book or dvd, but it’s also a whole lot more awesome than that and maybe we should give it a little more time and attention. Child Pose. You can do it in bed. Child’s pose puts your spine into the Primary Curve, the same curve your spine has when in the womb. No wonder you feel so safe and comforted there! It lengthens the back of the body as you curl your torso over your legs, creating space between the dorsal (top) surfaces of the vertebra of the spine and allowing an increase in flow of prana (energy or vital force) and citta (information or consciousness), or if you’re more scientifically minded it encourages blood flow and transmission of nerve messages through the back of the body (Borg-Olivier and Machliss. 2005). Of the nerves that branch from the spinal cord, we yogis are particularly interested in those that make up the Autonomic nervous system; you’ve probably heard your yoga teacher talking about the sympathetic nervous system (the ‘fight or flight’ mode) and the parasympathetic nervous system (‘rest and relax’). These nerves of the Sympathetic nervous system branch out from the thoracic and lumbar regions of the spine – the middle and upper back, while those of the parasympathetic nervous system are in the top of the spine and sacral area – the neck and pelvis. In child’s pose all these nerves are gently lengthened, or ‘tensioned’ (one of the few times when that tension word isn’t a bad thing! ), mobilising them and allowing them to function more effectively. Child’s pose also has your forehead resting gently on the floor – or if you’re not so bendy; on your stacked fists or a block, or you might rest your entire body along the length of a pile of folded blankets or even a bolster. Either way, you are encouraged to rest your forehead on something, which gently stimulates one of the branches of the vagus nerve that runs through the forehead (Robin, 2002). The vagus nerve is an important regulator of the parasympathetic nervous system, and so stimulation of this nerve slows the heart rate and lowers blood pressure, decreases tension and levels of cortisol. Curling yourself into child’s pose draws your awareness inward, it encourages what is known in yoga as pratyahara, a withdrawal of the senses. It’s about letting go of the external world, and connecting to your inner self so you can really get your yoga happening – that union between body, mind, spirit. Suzy Taylor is both super smart science geek and, well, super smart yoga teacher. But you probably guessed that already. We also love her earthy humour and her cooking. What style of yoga do mm...Yoga! teach? Enter the $1000 Squat Challenge here! If you can sit + stand up from the floor, you will live longer. We did our jobs well, yay! Yay! Here are the results of the client survey we sent out a little while back. We are *delighted* with them. Please keep giving us feedback so we can get even better! Why 'drop your shoulders' is a terrible yoga cue. Yoga for your neck & shoulders, because you asked!